The 2014-2016 roadmap for AMD’s Embedded solutions has been leaked. The AMD Embedded Solutions business unit relies almost entirely on products designed for AMD’s “Client” segment. So you can rest assured that any product making its way towards the embedded market will make its way to store shelves for ordinary consumers first. 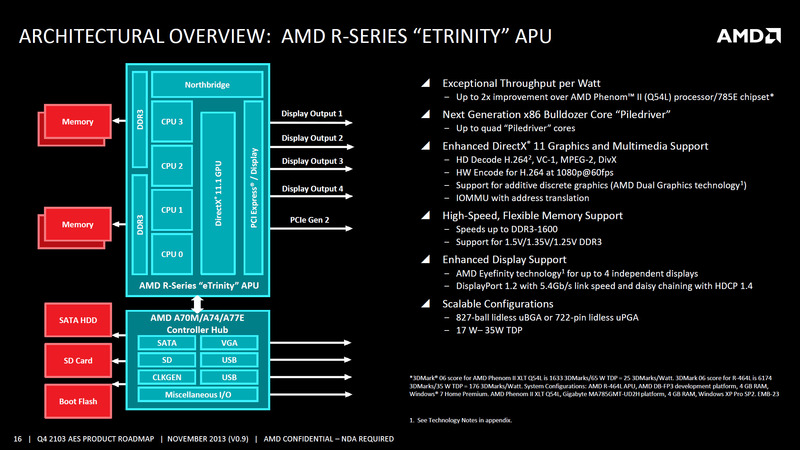 The AMD R-Series Etrinity APU is based off the x86 Piledriver core architecture featuring up to four cores. The Eternity APU delivers up to 2 times the improvement over AMD Phenom II processor series and have enhanced DirectX 11 graphics support along with HD Decode H.264, VC-1, MPEG-2, DivX, HW Encode @ 1080P/60 FPS, Discrete graphics support and IOMMU with address translation features. The Eternity APU also include faster memory support of DDR3-1600 MHz DIMMs rated at 1.5/1.35/1.25V. Display technologies include support for Eyefinity and Display port 1.2 capability. Since we are talking about a scalable chip architecture, the Eternity APU will be available in both uBGA and uPGA packages ranging from TDPs of 17W to 35W. The chip will be compatible with AMD A70M/A74/A77E PCH. On the high-performance side, AMD has the Bald Eagle APU/CPU featuring the x86 Steamroller cores. 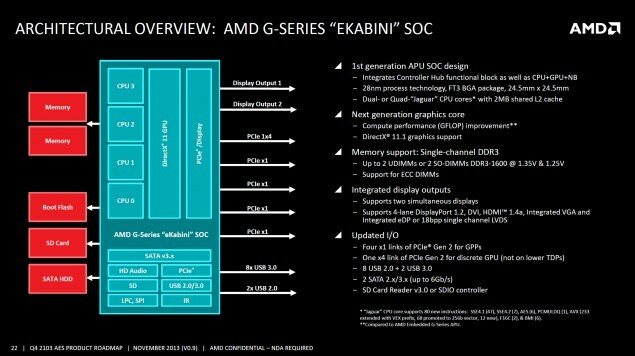 The Embedded chips would be available in Dual and Quad core variants with the APU models featuring an GCN enabled GPU with a TDP of 17 to 35 W. Both the APU and CPU models would feature full support for HSA enhancements delivering superior and next generation performance for embedded clients. The x86 cores will deliver 10-15% performance increase over Etrinity cores and feature 4 MB of shared L2 cache. The new graphics core will also deliver 15-30% performance increase over the eTrinity APU and feature support for DirectX 11.1 and HSA. The Radeon chip integrated on Bald Eagle would be based on the GCN core architecture and its a surprise that unlike the discrete desktop Volcanic Islands lineup which would possibly use a new naming scheme, the iGPs stick to the older branding scheme. 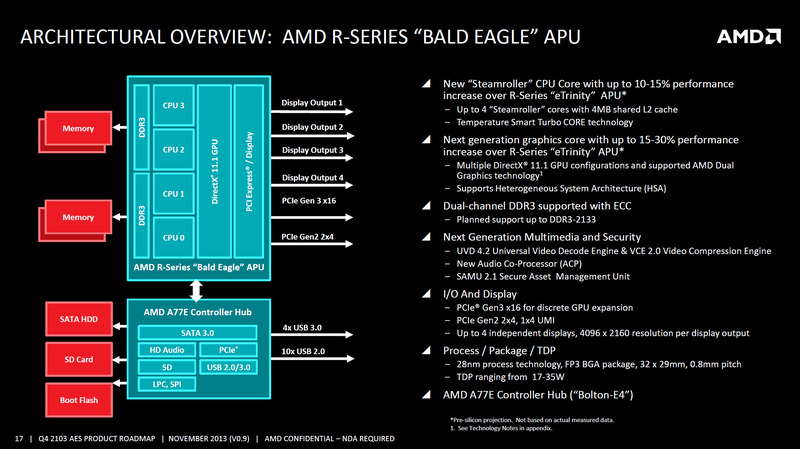 The Bald Eagle APU/CPU would replace the current R-Series APU/CPU which feature the x86 Piledriver cores. I/O features will include PCI-e Gen 3 support and will be available FP3 BGA packages since they are based on a new 28nm process design. TDPs will range from 17W to 35W and the chips will be compatible with the AMD A77E “Bolton E4” PCH. 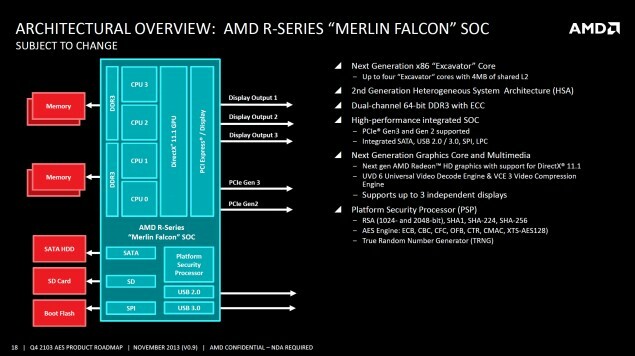 The Merlin Falcon SOC will be based off AMD’s next generation Excavator core architecture and will feature up to four x86 Excavator cores with 4 MB shared L2 cache. This series will target the high performance SOC segment and can be thought of as the embedded version of AMD’s upcoming “Carrizo” APU. We have official confirmation for the first time that the new Excavator CPU core and the Carrizo APU will be built on the 28nm process and not 20nm as was initially thought. Next Generation HD 10000 (Pirate Islands) Graphics architecture. 4 Excavator CPU cores with 4mb of shared L2 cache. ARM security processor. Similar to the one featured in AMD’s latest Beema/Mullins APUs. Dual channel DDR3 memory controller. UVD (Universal Video Decode) 6 and VCE (Video Compression Engine) 3. Another product in AMD’s Embedded high-performance lineup is the first 64-bit ARM based Hierofalcon SOC powered by upto eight ARM Cortex-A57 cores clocked at 2.0 GHz, 4 MB of L2 cache and built on the 28nm process technology. The chip will ship in the SP1 BGA package and features some new cache coherency feature such as full cache coherency, 8 MB L3 cache and SMMU (I/O address, mapping and protection). The chip allows dual channel 64-bit DDR3/DDR4 memory channels (ECC) with speeds of up to 1866 MHz. There’s also a crypto co-processor on board which might help mining cryptocurrency much more efficient. The SOC ranges between a TDP of 15 – 30 W. The highly integrated SoC includes 10 Gb KR Ethernet and PCI-Express Gen 3 for high-speed network connectivity, making it ideal for control plane applications. The “Hierofalcon” series also provides enhanced security with support for ARM TrustZone technology and a dedicated cryptographic security co-processor, aligning to the increased need for networked, secure systems. “Hierofalcon” is expected to be sampling in the second quarter of 2014 with production in the second half of the year. 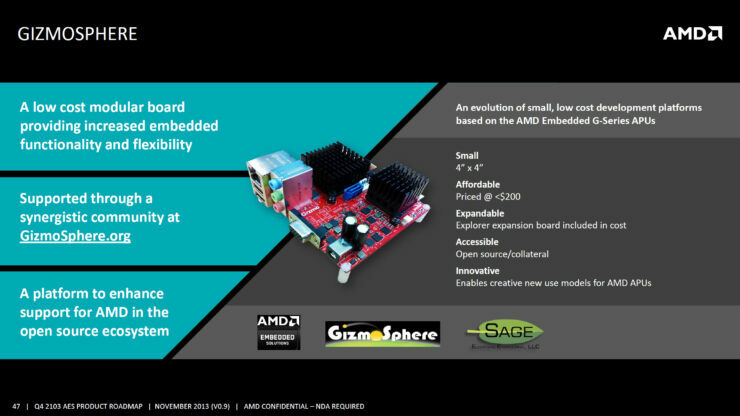 Next up, we have the AMD Embedded G-Series family which further consists of a few products. There are two solutions, the G-Series “A” family is the low power x86 based APUs/SOCs line while the G-Series “X” family is the low-power ARM based APUs/SOCs line. The line consists of the EKabini SOC, Steppe Eagle SOC, Pergrine Falcon SOC and EOntario APU. 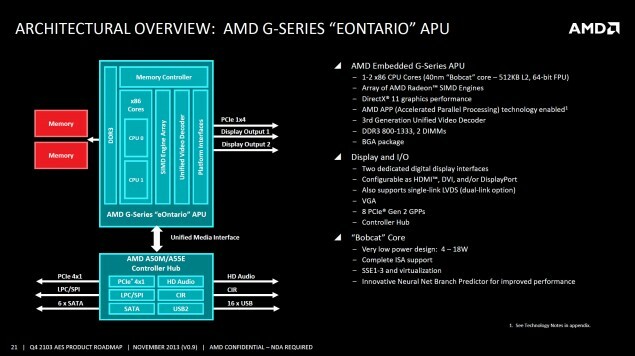 The AMD G-Series “Eontario” APU is based on a 40nm Bobcat core architecture featuring 1-2 x86 CPU cores that feature 512 KB of L2 cache and a 64-bit FPU. The chip makes use of a VLIW based SIMDs engine that has DirectX 11 support along with AMD APP (Accelerated Parallel Processing) technology, 3rd Generation UVD, DDR3-800/1333 MHz support and comes in the BGA package. There isn’t much going on with the I/O and display capabilities which have gotten rather old such as VGA, 8 PCI-e Gen 2 lanes, two display interfaces which can be either of HDMI, DVI or Display port standard. Supported by the A50M and A55E PCH, the Bobcat core powered Eontario APU comes in 4W to 18W chips. The EKabini SOC is as simple as it sounds, you may call it an enhanced and embedded variant of the Kabini APU which features the 28nm Jaguar core architecture. Available in dual and quad core models, the chip boasts 2mb L2 cache, and integrated PCH and is supported on the FT3 BGA package. Featuring support for single channel DDR3 memory and a maximum of 2 UDIMMs/SO-DIMMs rated at DDR3-1600 (1.35/1.25V). 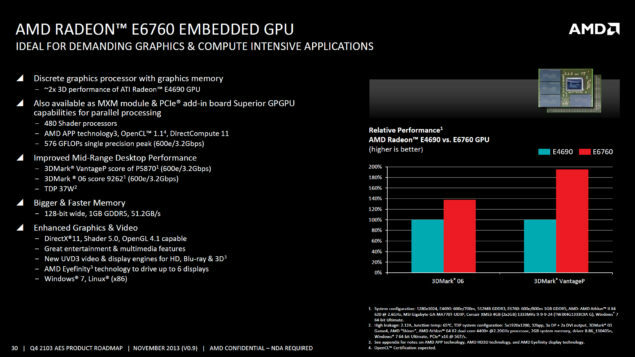 AMD says that their chip will feature a next generation graphics core which is actually their existing GCN core that supports DirectX 11.1. The chip will be available in a few scalable packages with an updated I/O controller that includes four x1 link PCI-e Gen 2, one x4 PCI-e Gen 2 for discrete GPUs, 8 USB 2.0, 2 USB 3.0, 2 SATA III, SD card reader v3.0 and SDIO controller. 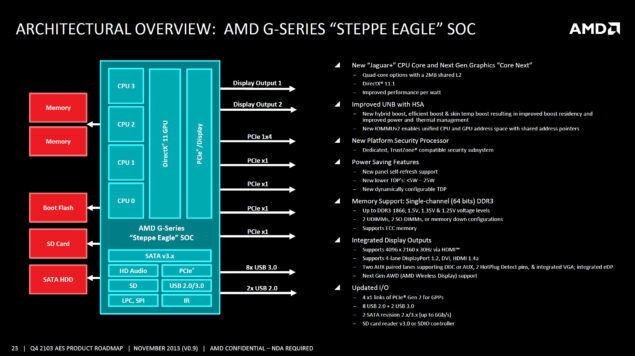 “Steppe Eagle” will further extend the performance and low-power range of the current award-winning AMD Embedded G-Series APU SoC platform with an enhanced “Jaguar+” CPU core architecture and AMD Graphics Core Next GPU architecture that include new features for increased CPU and GPU frequency. The updated design will feature a unified northbridge with full HSA support and configurable variants of TDPs with less than 5W and up to 25W. Designed for low-power embedded applications, “Steppe Eagle” is designed to offer increased performance-per-watt both at a lower TDP than the current AMD Embedded G-Series APU SoC, as well as extending the high-end performance above 2 GHz. “Steppe Eagle” also provides embedded design engineers the flexibility to leverage the current AMD Embedded G-Series APU SoC board design and software stack for a variety of applications with footprint compatibility. “Steppe Eagle” is expected to be available in the first half of 2014. The series will target the low power segment. And will succeed the Beema/Mullins APUs. AMD will introduce its first ARM based APU solution ever next year. Code named “Lanner Falcon” these APUs are part of the “SkyBridge” initiative which allows AMD to build pin compatible x86 and ARM based chips. The Lanner Falcon and Peregrine Falcon family of parts can be thought of as sister x86 and ARM APUs that will offer identical functionality but in two different instruction set flavors. The ARM based Lanner Falcon will feature the new 20nm Cortex-A57 cores in quad core variants along with support for AMD’s eight generation GCN based HD 10000 series graphics family. The x86 based Peregrine Falcon SOC will be based on the new Catamount architecture in dual and quad core flavors. Both chips will add HSA 2.0 functionality with OpenGL ES, OpenCL, DirectX 11 and EGL support. The multimedia features will be upgraded with 4K x 2K H.265, multi-format encode and decode. 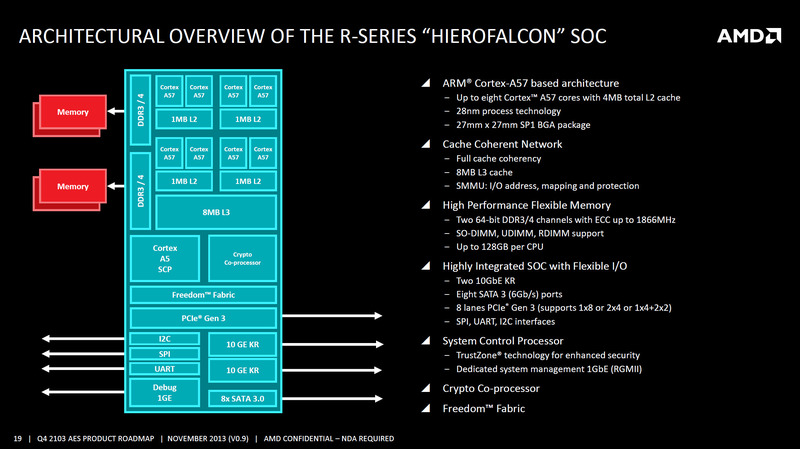 Peregrine Falcon SOC will support DDR4 ram and would be based on the 20nm PUMA+ core architecture. 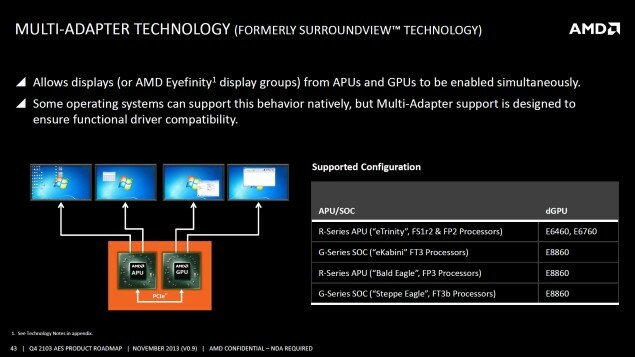 These slides are a bit old and won’t mention the details we have gotten to know since AMD detailed their Skybridge initiative few months. 4 x86 or ARM cores (Puma or A57) with 2mb of shared L2 cache. 8th generation (HD 10000/Pirate Islands) graphics cores. 4K x 2K H.265 encode and decode. 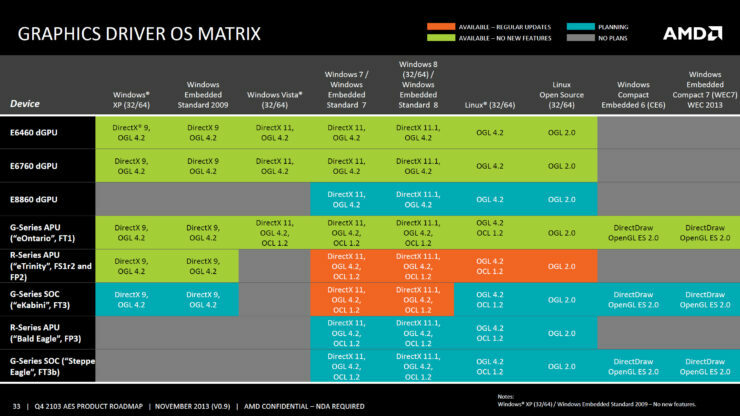 AMD’s leaked roadmap didn’t offer nearly as much detail on the graphics side as it did on the APU side. 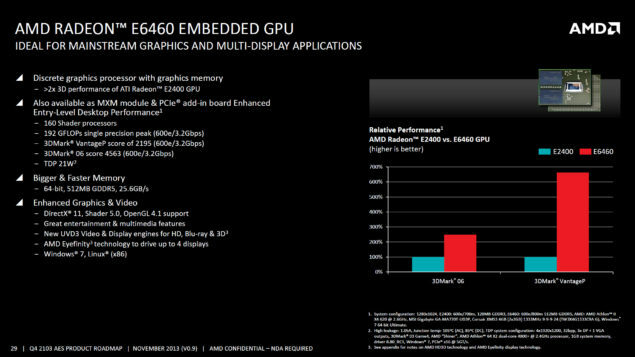 This is down to the highly competitive nature of the graphics front which forces AMD to be more secretive on that front. However we did get a very valuable tidbit of information, a timeline for the launch of next generation discrete graphics products. 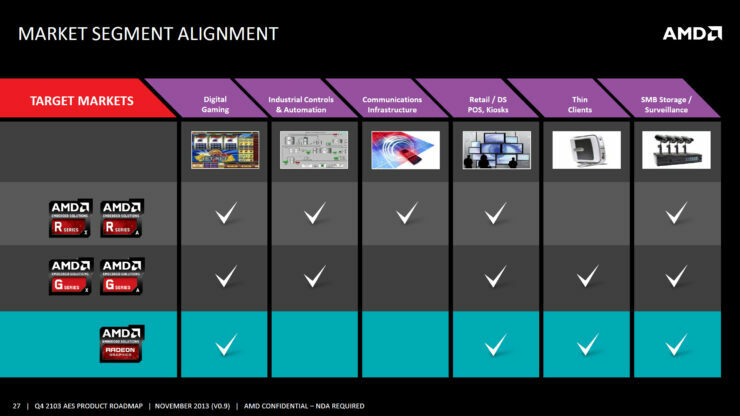 If you look at AMD’s Radeon graphics roadmap you’ll notice that guidance is completely missing after late 2013. That’s because this roadmap was originally revealed to investors in November of 2013. We’ve only now gotten our hands on it. But there’s a clear pattern. When a graphics product is released for the client segment it’s followed by an embedded version approximately two months down line. 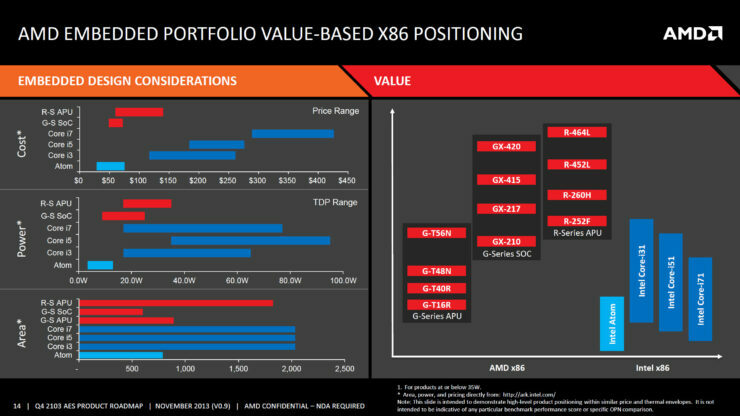 We can extrapolate from that the approximate timeframe for AMD’s upcoming graphics products for the client segment based on the E10xxx series. 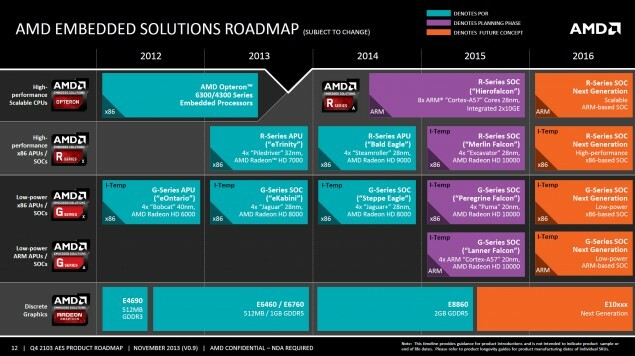 This puts the timeframe for AMD’s new cards between lat Q4 of this year and early Q1 of 2015. 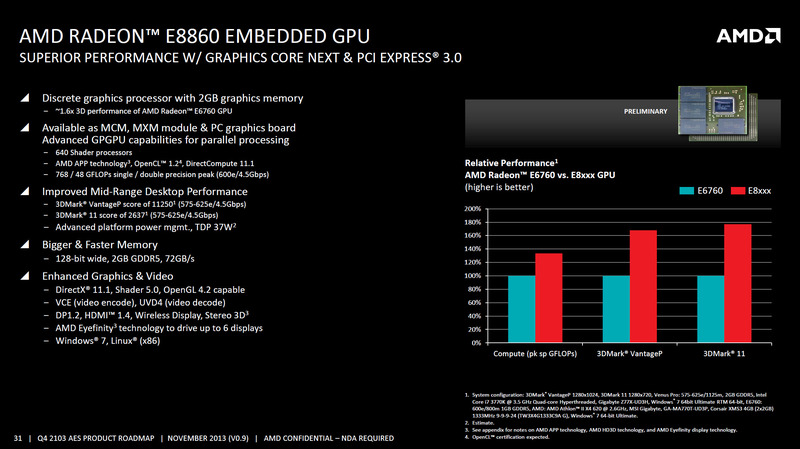 Before then AMD will have to make do with game bundles and price cuts to compete with Nvidia’s GTX 900 series. 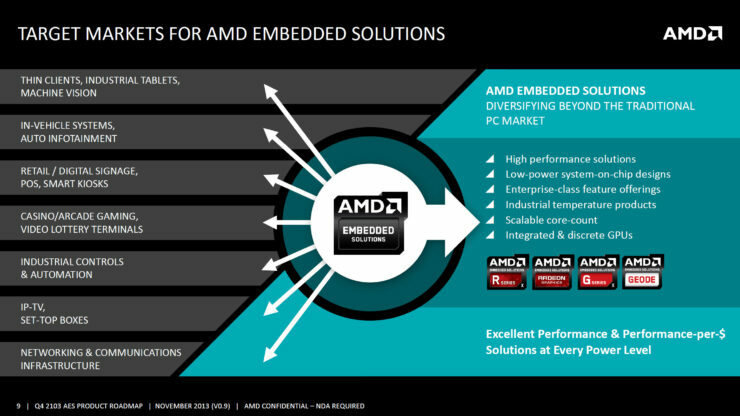 AMD is also poised to make an announcement on September 25th so stay tuned for more info.